The M65 Jacket was first introduced in Nineteen Sixty Five to replace the M51 Jacket that had been used during the Korean Conflict. Incidentally, the M51 Jacket was made to replace the M43 Jacket used in WWII. The M65 Jacket was used by US Armed Forces during the Vietnam War. The jacket was very useful in keeping the soldiers warm from the cool temperatures that came with the monsoon rains. The M65 Jacket had a hood that could be rolled up and stored. It also used Velcro-fasteners to secure the cuffs. With only a few modifications from its original design, the M65 Jacket is still being worn by our troops in the field today. Although the original drab olive green color has been replaced with today's camouflage, the Universal Camo Pattern or 'UCP', the M65 Jacket is virtually the same as the original except for the removal of the epaulets and the addition of Velcro on the sleeves to allow for rank patches. The M65 Jacket is easily combined with an insulated lining to allow for use in the cold weather. The M65 Jacket is made from a Sateen Water-Resistant Cloth. It has been sewn to military specs. This jacket is as close to the real deal as you are going to get without joining the Army. 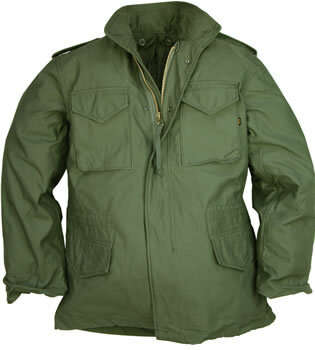 The M65 Field Jacket has two large hip pockets and two breast pockets. It has a heavy zipper along with a storm flap that snaps. The M65 Jacket comes with a removable nylon inner liner. It is wind resistant and repels water. It comes with a draw-cord for the hood and waist. Need to make a fashion statement? Our vintage M65 Regiment Jacket is just the job. Not only has the M65 Jacket been a part of our troop's attire for over Forty years it has been worn by the general public for just as long. I had one that I wore in school many years ago. You can't walk down the street today without seeing someone sporting one. The M65 Jacket has stood the test of time and will still be stylish enough to be worn forty years from now.